Choosing the correct steam cleaning equipment for your steam cleaning job is vital. Allow us to assess your cleaning needs so that the appropriate cleaning solution is implemented. The steam generating equipment can be mobile capable of generating its own steam or fixed steam units can be wall or ceiling mounted and fed by an external boiler (if available). Dry saturated steam is capable of eliminating traces of oil, grease, dust and metal particles from all types of surfaces. The gaseous form of steam has a very low psi and poses no risk of damage to all types of machinery including electrical systems, robots, sensors, floors, walls and conveyor belt systems; all can be cleaned safely and returned to immediate service. We understand that prevention of food contamination by microbes and chemicals is important, dry saturated steam is capable of cleaning and sanitising food processing equipment while producing minimal waste by products. The VIP and Billy Ecoline models are suitable for the contract cleaner for domestic steam cleaning to light commercial steam cleaning. REA range of steam generating equipment is suitable for light to heavy industrial steam cleaning. Powerful equipment from 9 kW to 72 kW either mobile or stationary (fixed) to suit your industrial cleaning requirements. BILLY ECOLINE is an electronic control industrial steam cleaners with easy accessible controls on the handle. It is specifically designed for commercial cleaners who require more power and steam with our without detergent capability and a detachable vacuum. Boiler water level automatic control with water refilling tank (external, not under pressure) can be refilled when machine is in operation. Boiler in steel AISI 304 3mm thickness. Steam flow control and low voltage manual switches. Visual warning and shut off of steam drive in case of water shortage in the external tank. Visual warning and shut off of the heating elements in case of refilling system failure. Models available: 3kW for contract cleaners and 6kW for use in small industrial workshops. The stationary steam generating equipment (36kW and 72kW) can be wall, floor or ceiling mounted in a fixed position. If you already have steam generated on site, the equipment can be adapted to be fed from your boilers (externally generated steam). The stationery steam cleaning equipment is suitable for use in washing bays, maintenance areas, conveyor belts and where the steam cleaning equipment does not need to be mobile. 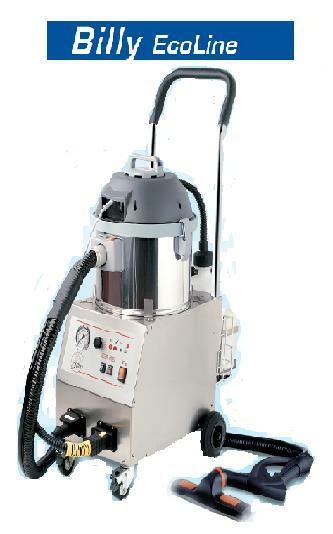 REA range of mobile steam cleaning equipment can be used throughout your plant and workshop. 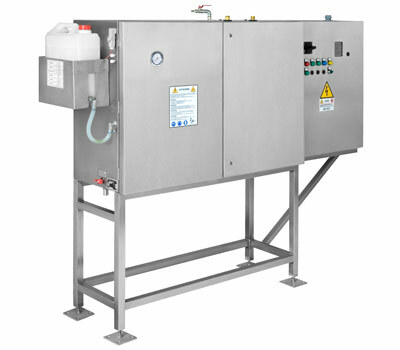 Use the equipment when and where required with its steam, detergent and vacuum capability. These models are supplied with robust steam cleaning accessories applicable for your cleaning requirements. Two model are available without a detachable vacuum. REA SUPER (steam, detergent and vacuum) is a 9kW steam generator that is the entry level for light to medium steam cleaning that is a good all purpose machine. The standard length of hose is 4 metres with hose length available to 12 metres. The S9E model has steam and detergent only. REA SPECIAL 2 (steam, detergent and vacuum) is a 18kW steam generator for medium to heavy industrial steam cleaning. The more power input the dries the steam produced. Hose length available from 6 metres (standard) to 20 metres. The S18E has steam and detergent only. REA MAXI 4 (steam and detergent) is a 36kW steam generator powerful enough to all industrial and workshop steam cleaning. Hose length available from 8 metres (standard) to 36 metres. Can be integrated with a vacuum.